have I created value for the visitor? page focuses on visitor's needs or on me making money? The first instruments ever used to accompany singing and dancing were clapping hands and stamping feet. 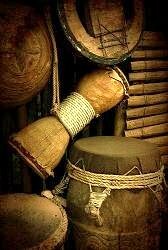 Next were probably objects like sticks, logs, hips or rocks to play rhythms and voilà: the first idiophones were born! In order to play louder, some smart brains must have started to craft more complex instruments like log drums or slit drums. As the experimenting continued, the powerful sound that results from stretching a skin over a resonator was discovered: a membranophone! You would love to learn about African culture? 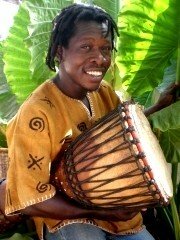 Traditional drumming is a great way to get a taste of this magical continent. You'll not only broaden your horizon, but also connect with an interesting crowd of like-minded people around you. AdSenseBoxLeft: The float:left style in the .AdSenseBoxLeft class forces the AdSense Box to the left, which "pushes" this text to the right of the box. Clear: Use a (<p class="clear">) to break the wrap, like in this paragraph (see source code). It enables that paragraph (and everything following) to break free of the lower margin of floating objects, even if "there is room" for more text to wrap around it.